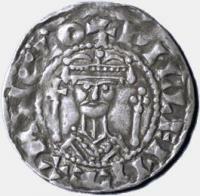 Silver pennies were the only coins and William the Conqueror marked his with PILLEM REX ANGLO, William King of England. (Perhaps the cross and sceptre show his right to invest both bishops and lay lords.) William collected a tax of one penny per household for the Papal See. However, he makes it clear that this payment represents alms — the usual prayers-for-fee arrangement — not tribute to a feudal overlord. The pope gave his blessing to the Norman invasion of England and hoped that this would enable him to take the conquered territory for himself. In 1066 William I gave over a quarter of the land in England to the Church. “His conquest bound the country not only to France, but also to Rome”. Not satisfied with this, the pope pressed his claim to the rest of the kingdom. ♦ The pope's first attempt was to rule directly through fealty, which William refused. ♦ His second attempt was to govern “the whole of Britain” through the papal legate, but the pope's man was ignored. ♦ Finally, in 1107 the pope made a third attempt. The pope drew up a document to let him control the landed churchmen who already owned much of England. This papal document was the world's first concordat. In the 900 years since the Concordat of London concordats have proven so effective that they have formed the cornerstone of Vatican diplomacy. Though William declined to hand over his kingdom, he was still eager to benefit from papal prayers. He promised to send along the overdue “money”, that is, “Peter’s pence” — but only as alms, not as tribute. This, however, was not enough to satisfy the papacy. William's refusal set in motion a quarter of a century of wearing down successive English kings until finally William's youngest son, Henry I, signed the world's first concordat. William, by the grace of God the renowned king of the English, and Duke of the Normans, sends greetings of friendship to Gregory, the most noble Shepherd of the Holy Church. Your legate Hubert came to me as your representative, Holy Father, and ordered me to do fealty to you and your successors, and to think better of my decision about the money which my predecessors were accustomed to send to the Roman Church: I agreed to one of these requests, but not to the other. I refused to do fealty, and I will not do it; for I did not promise it, nor do I find that my predecessors did fealty to yours. As to the money, it has been carelessly collected for almost three years, during the time that I was in Gaul. Now that I have returned to my kingdom, by the mercy of God, what has been collected is being sent by the aforesaid legate, and the remainder will be dispatched, when opportunity is offered, by the legate of Lafranc, our trusty Archbishop. Pray for us, and for the well-being of our realm, for we have loved your predecessors and wish to love you with all our heart and to hear you obediently, above all things. Source: Letter to Gregory VII (c. 1075): Giles, Patres Eccl. Angl. : Lafranc, i. 32, letter x. Henry Scowcroft Bettenson, ed., Documents of the Christian Church, (OUP, 1976) p. 155. The pope the made a second attempt to rule Britain, this time through his legate, but that failed, as wel, according to Eadmer, a Benedictine monk, noted historian and close friend of St. Anselm, the Archbishop of Canterbury. This portrait of Eadmer sharpening his quill was done a couple of decades after his death. The papal legate he writes about below was Guy, Archbishop of Vienne and future Pope Calixtus II. In that year there came to England Guy, Archbishop of Vienne, holding, as he said, by the direction and authority of the Apostolic See the Office of Papal Legate over the whole of Britain. When this was reported throughout England, all were astonished, as everyone knew that it was a thing unheard of in Britain that anyone should exercise authority over them as representing the Pope except only the Archbishop of Canterbury. Consequently, as he came, so he went back, not recognised by any as legate and without having acted in any way as such. Source: Eadmer's History of Recent Events in England, G. Bosanquet, ed., (London, 1964), pp. 131-32. “The seven sacraments could serve as a great weapon in controlling the conduct of people because through denial of the sacraments the church could prevent entry into heaven. A person might be excommunicated, that is, not allowed to partake of the Eucharist. The papacy's third attempt to increase its control of Britain was met with success. A quarter-century after the failed attempt to secure fealty from William I Pope Paschal II managed, by threatening to excommunicate the king, to get Henry I to sign the world's first concordat. The national church wielded secular power in the kingdom. Government business that required literacy was carried out by clerics, the church owned much of the land and when the king was away the Archbishop of Canterbury ruled as regent. The Concordat of London talks about the symbolic objects in the ceremony of investiture, but the change in liturgy reflects a new level of papal control over Britain. Henry I could no longer invest bishops with the symbols of Church authority, the crook and ring, as his father and brother had done, but merely receive their homage, a face-saving gesture. As before, the archbishop’s badge of office, his stole (pallium), had to be fetched from Rome. No text survives of the world's first concordat, only this summary by an eye-witness, the monk Eadmer. 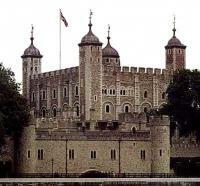 On the 1st August  an assembly of bishops, abbots and nobles of the realm was held in London in the king’s palace. 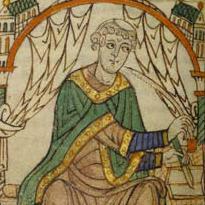 First, for three successive days, without Anselm being present, the question of investitures of churches was discussed between the king and the bishops, some of whom tried hard to secure that the king should continue to perform such investitures, as his father and his brother had done before him, without regard to the pope’s prohibition or the obedience due to him. The Pope, while standing fast on the sentence that had been promulgated on that matter, had allowed homages, which Pope Urban had prohibited equally with the investitures, and had, by that concession, brought the king to agreement with him on the question of investitures, as may be gathered from the letter we set out above. Afterwards, when Anselm was present, with the populace standing by, the King assented and declared that from that time forward no one should in England ever again be invested with a bishopric or abbey by presentation of the staff or ring at the hands of the King or of any layman. Anselm on his side conceded that no one elected to any preferment in the Church should be deprived of consecration to the office to which he had been appointed because of his having done homage to the King. And now that these questions had been so settled, on the advice of Anselm and of the nobles of the realm, the King appointed fathers to almost all the churches in England, which had been so long widowed of their pastors, but without any investiture with the pastoral staff or ring. Source: Eadmer's History of Recent Events in England, G. Bosanquet, ed., (London, 1964), p. 199. The result of this was the Concordat of Worms (1122), modelled on its London predecessor, which fatally weakened the power of the German king. Germany became splintered among princelings, both dukes and abbots. In the course of the Middle Ages the king gradually lost even his remaining holdings as he leased his imperial estates and was obliged to grant the imperial cities ever more freedom. Germany did not recover until its unification in the 19th century. 1. Terry Jones and Alan Ereira, Terry Jones’ Medieval Lives, (BBC Books, 2004), p. 7. 2. Lester B. Orfield, The Growth of Scandinavian Law, University of Pennsylvania Press, 1953, p. 37. 3. The Catholic Encyclopedia acknowledges London as the first concordat, however, today the Vatican doesn't mention it. There are many possible reasons for preferring to call the German Concordat of Wurms the first one: the present pope is German, Germany still has concordats and the 900th anniversary of the German one is coming up in 2022. On the other hand, the London concordat got cancelled by the Reformation and, although the Vatican lost its text, a published account of the negotiations still exists which, in pious prose, outlines Vatican tactics: Eadmer's History of Recent Events in England [Historia novorum in Anglia], translated by Geoffrey Bosanquet, (London, 1964). 4. Terry Jones and Alan Ereira, Terry Jones’ Medieval Lives, (BBC Books, 2004), p. 97. 5. Paschal II to Anselm (Archbishop of Canterbury), 12 October 1108. G. Bosanquet, ed., Eadmer's History of Recent Events in England, (London, 1964), p. 217.